As a blogger, I have so many things to do while covering an event, be it press conference, bloggers conference, product launch and more. I also have to had a gadget that can help me more to make my work easier. Last December 2014, Torque introduces smartphones and phablet with rotating camera (story HERE) and all are in wow.. when exploring and experiencing it. But what I have on hand is another product of Torque that fits your budget and will definitely meet your demands, just like me. Let me share with you what I like about Torque DROIDZ Atom S. There are things I will share with you wherein Torque Droidz Atom S can help me more about my lifestyle from covering events, maintaining my hobby (photography) and surfing the net. 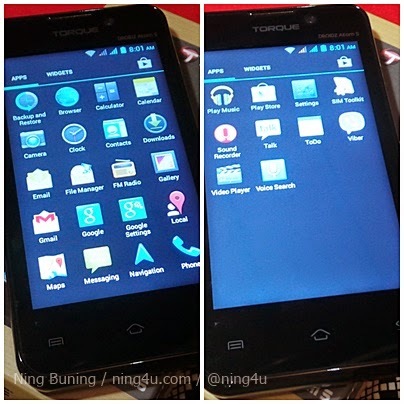 Torque DROIDZ Atom S is a Dual SIM, an 4.2.2 Jellybean Android smartphone that can access two networks in one phone. Since I am using Smart and Sun Cellular, it is easier and convenient for me to use this phone. You will not find it hard to distinguish weather the message come from Smart or Sun because it is indicated on its 4" and WVGA 480×800 resolution screen. Torque DROIDZ Atom S has so many features that can easily navigated though its 4.0" WVGA Touch Screen, but for a blogger like me, I always use the ToDo widget, where I can easily list down my schedule for a week and can tick the items if it's done. Sound Recorder, wherein I can record interviews clearly and lengthy, it has also a pause button, if you want to skip a particular part of the segment. The most important of course is the Camera/ Video, for me to capture and record important information and images of celebrities or products. Torque DROIDZ Atom S has a 1GHZ Dual Core which I can use various apps or features simultaneously running in good condition. So with Torque DROIDZ Atom S rear/VGA front camera, I can easily upload photos on my social media accounts like Facebook, Instagram and Twitter. Torque DROIDZ Atom S has a clear signal in every FM Radio station, I use to listen to my favorite station while heading for work/home or if I am relaxing. I bet you no interruptions even in Boni or Ayala station, I'm sure some of you know what I mean hehe.. Some of you, including me, always checking this feature on smartphones and believe when I say that Torque radio is good. Sometimes I am using a boombox at home and it has a more great music. Torque DROIDZ Atom S has an easy navigation, specially if you want to access the Google, camera and unlock your phone immediately. Torque DROIDZ Atom S is a ready 3G Wi-Fi access, Wi-Fi hotspot, GPS and Bluetooth. Sharing connectivity with your friends is not a problem as well as sharing thoughts online. Torque DROIDZ Atom S is not a high-end smartphone in the market, but if you want one with good features that you always use like what I shared with you above, well Torque DROIDZ Atom S is enough, specially with its reasonable price of 2,899Php. Now available on the leading smartphone stores nationwide. For more information and details about Torque Smartphones, Phablets and Tablets, visit www.facebook.com/torquemobile and do follow them on Twitter @torquemobile.